Seems a little close to the highway to have anything that would really sling dirt ala Sprints or super late models. my parents did the horse racing photos at these fair grounds and many others, you may recall them Steve and Sherry Landon. at this moment we are getting ready for fair that is next week and it is going to be a blast, demo derbys, horse pulls, car enduro race, and much much more, 4-H is our thing, infact you will see my set of seats from the gardern theatre of Marshall MI on display if you stop by. I also forgot to mention that they also held many concerts over the years. This will be the 2nd year with out a concert and with the country and rock fest it is not proftiable to hold a concert at the grounds. I will have to get some pics up eventaully. MOVE THE ROAD. I wish. The race i saw there was great. but for more racing don''t count on it. tracks only a few feet from the road and right in town. to bad. Looks like a little Pocono Raceway. Well Don it''s about time they did race a car there. Looks like a great place to. I lived in Harrison 72-78, 4th-10th grade, this was a Sulkey hourse race track. I never saw a car race. However they did race snowmobles for a couple of years. My dad raced so I got to circle the track a few times. Open this track up. I agree Sean, looks like a great place for racing (well from above). doesn''t anyone have pix of the grounds?. Looks like an amazing track, love it if they raced there. Correction= The fair is over 130 years old and it is known as the clare county fair. 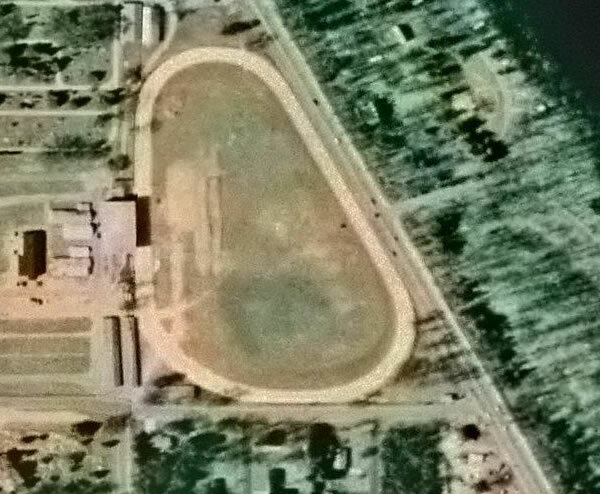 I seem to remember a sprint or midget race here in the early 1980s. Does anyone else remember this. It may have been during fair week. I have been to the Harrison Fairgrounds a lot. I pretty much grew up in Harrison I believe this fairgrounds is like a 100 years old. It is on Clare Avenue in downtown Harrison right across the street from Wilson State Park. I am not sure when they stopped racing cars there but they still have the 4h fairs there and on the big holiday weekends. They also have the mud boggs and 4th of July fireworks and crash up derby cars. There are concerts with some big name performers as well. I remember one year the country group Alabama was there.